Systematic and Gross Human Rights Violations in Graeco-Roman Egypt, South Africa, and Israel/Palestine. Author: Anthony Löwstedt, with a Foreword by Ilan Pappe, and a Postscript by Richard A. Falk. 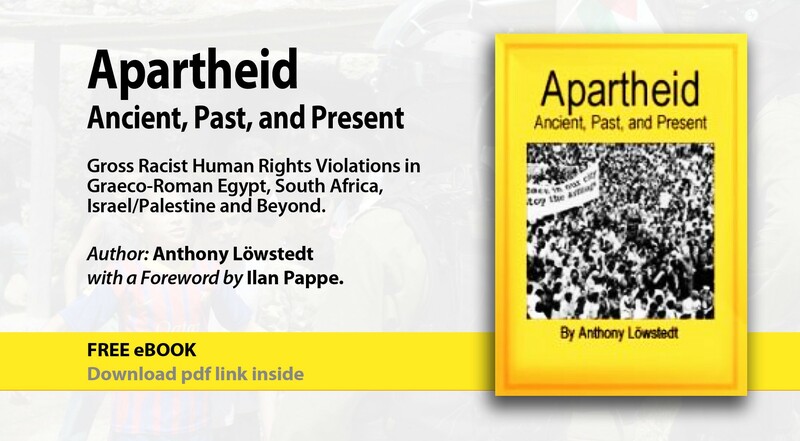 Although the association of apartheid South Africa and the Palestine issue has been in the air for quite a while, very few scholarly books tackled the comparison in a profound and professional way. This book is one of the first serious attempts to engage with the complex situations both in South Africa and in Israel/Palestine. As this book shows in a very clear way, apartheid was a multifaceted system of oppression, violence and dispossession. The treatment of apartheid in such a comprehensive manner allows for a better and more useful comparison of the various components that made up the historical case of apartheid in South Africa in the past and which are at the basis of the current situation in Israel and Palestine, however one chooses to define it. As this book and other works have shown, there are also quite significant dissimilarities between apartheid South Africa and the historical and current situation in Israel and Palestine, nonetheless there are still many principal aspects of the phenomenon which are almost identical. As this book shows in a very clear way, apartheid is a multifaceted system of oppression, violence and dispossession. The treatment of apartheid in such a comprehensive manner allows for a better and more useful comparison of the various components that made up the historical case of apartheid in South Africa in the past and which are at the basis of the current situation in Israel and Palestine, however one chooses to define it. As this book and other works have shown, there are also quite significant dissimilarities between apartheid South Africa and the historical and current situation in Israel and Palestine, nonetheless there are still many principal aspects of the phenomenon which are almost identical. But, as the writer of this book notes, ‘Apartheid is not a very complicated phenomenon’, and its basic impulses and aims were clear and they are easily identified in the Israeli policy in Palestine. This was long ago recognized by the non-professional section of Western society. The public opinion and activists have not waited for scholarly research in the matter to mature and be completed. They are already inspired by the comparison with South Africa in the struggle for Palestine and the Palestinians in two ways. Firstly, the term, ‘apartheid’, seemed to be as close as one could get to describe the Israeli policies, which are mainly characterized by the fragmentation of the Palestinian existence through colonization, segregation and dispossession. The different Palestinian groups are subject to different policies: from second-rate citizenship inside Israel to a slow genocidal strangulation in Gaza. And yet there are common features for this Israeli policy and strategy and one of them is the wish to exclude the Palestinians from the privileges and rights that the Jewish population enjoys in, and on, the land. This exclusion was easily described as apartheid by the activists around the world who showed solidarity with the Palestinian struggle; even more so after the Israelis created the Apartheid Wall on the one hand, and passed explicit apartheid laws against the Palestinian citizens in Israel in recent years, on the other. Secondly, the struggle today for public opinion and support is deeply inspired by the anti-apartheid movement in the world that became quite potent and influential during the heyday of the South African oppressive regime. So there are ample and good reasons to provide a deeper and wider scholarly infrastructure for the political impulse and solidarity strategy. This book is a very good beginning. It does not confine the comparison to South Africa alone. After all, apartheid and segregation accompanied other colonialist and post-colonialist regimes and these case studies are equally important for such a comparative study. The novelty here, however, is not confined to extending the comparison geographically or chronologically. What the author calls the ‘wide sense’ of apartheid exposes layers quite often hidden from the public, and quite often the professional eye. These include the impact of segregation polices in both societies on individual violence, family cohesion and gender issues. It is this expansion of the definition of the phenomenon of apartheid that enables one to see similarities not immediately observed, and also differences that at times show how bad the situation of the Palestinians was and still is. The awareness that the story in one case, South Africa, has come to an end, and the terrible sense of worse to come in the other, in Israel and Palestine, give this book particular urgency and vitality. As the author concludes: this state of affairs should be cautiously regarded as hopeful for Palestine and the Palestinians. Despite the conflict and tension in post-apartheid South Africa, the process of reconciliation and change has been completed. Cynics would point to the continued role of capitalist global powers in the process and highlight the less savory aspects of the transition. But, as this book makes abundantly clear, justice was nonetheless served when apartheid fell. So it is not a super model, nor one that cannot be, or should not be, improved. But it is inspiring to think that it would be possible for the South African model of post-apartheid justice, as flawed as it is, to recur and reappear in Israel and Palestine.